This has to be the oddest name for cloth; it sounds more like a rare Leatherworking reagent (despite the icon and white quality). It doesn't appear to be cloth scraps at all, either; and yet the description points towards it being used as cloth. Feel free to downrank this as soon as more information is available, but for now all I'll say is that there seems to be precious little information on tailoring. Could there be two kinds of cloth that drop in Draenor? We already know that the daily cooldown cloth is Hexenzwirnstoff; but information seems to be lacking to confirm that this is indeed the new cloth. * Since my original comment, the name of this item has changed. It used to be called 'Native Beast Fur'. Sumptuous Fur still doesn't sound appealing to tailors! As of the latest beta patch, Sumptuous Fur is dropping as LOOT from Shadowmoon Stalkers (level 90 wolves in Shadowmoon). Being a skinner I can then procede to skin the animal for Raw Beast Hide. As others have mentioned, this is a big change from the normal humanoid/undead drop of cloth for tailors and first aid. I personally find it an unfair advantage for skinners as they can farm "cloth" AND leather from the same beasts. The tailoring building in the garrison offers a work order: 5 Sumptuous Fur in exchange for Hexweave Cloth. The building can be built and work orders can be completed even if you don't have tailoring. You can then ask the tailoring NPC Christopher Macdonald in the building to craft you cloth armor or Embroidery with the Hexweave Cloth you receive. As the Hexweave Cloth is BOP, you can't exchange it with other players or sell it on the AH. Sumptuous Fur may also be acquired through trapping talbuks and wolves for barn workorders. The elite beast for a level 3 barn fur workorder is Terrorzahnalpha. Tailors now get drops of beasts, instead of Humanoids. Don't know why they changed it, but they did. Pretty good farming spot that i have experienced is in 'Spires of Arak' at the coast. Just kill those feral druids... i mean those bloodmane mobs. Sadly i dont have any numbers. Just give it a try! I highly recommend the Shivering Trench's frost wolves for Hordies; they've got a rather good drop rate, fast spawn and big numbers. I found Tailthrasher Basin in Southern Gorgrond (43, 90) to be a good farming spot. Lots of mobs and they drop a fair amount of fur. Given that this does not drop from humanoids, does cloth scavenging Plündern von Stoffen affect drop rates? Excellent start dropping from mobs "Ridge Prowler", but for for some reason I can not find on wowhead, so it to show a similar creature - . 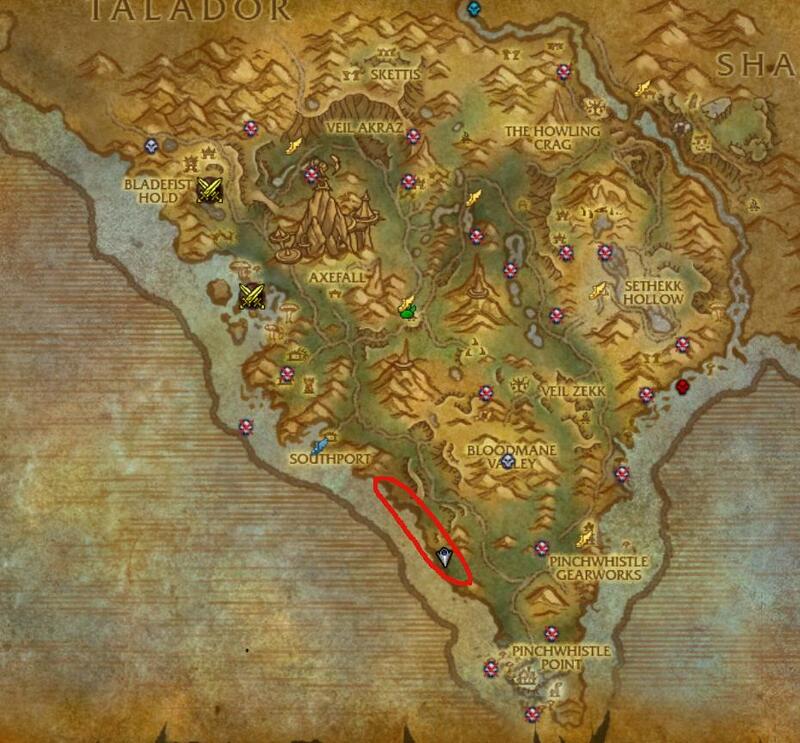 Start dropping at 1-3 pieces, sometimes 5 in Talador above Fort Rinn coordinates - 66 17. Within 25 minutes you can collect about 50 pieces. 50 pieces are enough to do daily things Tailoring profession and start a process in Hexenzwirnstoff in your garrison. Not all cloths are grown from plants. People have been making CLOTH from the "fur" of animals such as angora rabbits, and sheep, for eons. So collecting fur for cloth makes sense from this point of view. If you're also a skinner I would suggest you start at that cave and work up the coast killing Coldsnout Boars. They drop less Fur but are skinnable and are very plentiful. This is the Windwool Cloth of WoD. Though it has several tradeskill uses, as you can see by clicking on Reagent For, you're Leveling Tailor will benefit from it the most. Does Cloth Scavenging work for , does it work for humanoids in Draenor from the new expansion Warlords of Draenor? Looks like they may have stealth nerfed the drop rates of fur from mobs. I used to farm in Spires of Arak and get tons of them, now only get a few every so many mobs. Strange thing is I can't find any mention of this in the patch notes. If the wolf area east of your garrison in Frostfire is being camped by a bunch of people, fly to Wor'var in Nagrand and right outside the base there are a few trees with 3-5 talbuks. You can also get fur from turning these talbuks in to your barn. As I only use the fur for daily Tailoring cooldown I have found the Wolves close to the Alliance Garrisson to be the best spot, easily killed and you get drops fairly frequently. A really good spot for farming Sumptuous Fur is Daggerjaw Raiders and Daggerjaw Hoarders just east of Fort Wrynn, Talador (or just north of Vol'jin's Pride). They have slightly under a 1:1 drop rate and they respawn fast enough that you can circle the lake and they'll be back by the time you make it all the way around. Plus they're only level 94 so they're quick and easy to kill, AND they fight each other so they often have even less health! You should be able to get around 250-350 furs an hour there. For those looking to farm while farming, Dornfelltalbuk drops Fragment eines gorianischen Artefakts in addition to Prächtiges Fell. Without skinning, there's seems to be few activities that you can do while gathering material for tailoring. This is a sharp contrast to previous expansions where you were much more likely to get cloth from your normal activities like running a dungeon. Edit: I recommend avoiding the elites in the area as they don't drop enough fur for the increased time investment of killing them. It's almost always heavily camped, but for horde the frostwolves in the Shivering Trench just east of your garrison is amazing, especially if you have a skinner and/or a barn. There are two sets of frostwolves sleeping right across from each other, each group has about 6-7 wolves. My hunter would drop a trap then barrage. The first to reach me would be trapped giving a furry beast for the barn, the rest would die. Loot, skin, turn around and repeat. I had about 15-20 minutes where nobody else was in the trench and got 247 Raw Beast Hide, 122 Sumptuous fur, and 9 Furry Caged Beasts, not to mention 4 greens for enchanter and about 100G worth of vendor items, mostly Luxurious Pelts, mangy pelts, and serrated incisors. The talbuks around nagrand are also great, especially if you need timber for your lumber mill. One circuit around nagrand got me 21 Caged Furry Beasts, 250 timber, and about 90 fur. The talbuks take longer to kill, so I mostly trapped while in nagrand. In Spires of Arak, I'm finding the boars on the coast west of Axefall are dropping good numbers. Maybe I'm getting lucky, but they are dropping 3 per kill. I am a skinner so I had tons of this stuff. I was just selling it to regular vendors just to get more space in my bags. Actually you can use it to level your FIRST AID profession. Sumptuous fur makes special antiseptic bandages (Cures of Draenor) which heals for 47,440 damage over 8 seconds. "The healing properties of Sea Scorpion venom can be absorbed through the skin, but application is slow." Hoping this will clear up some of the confusion our beloved tailors have been experiencing. I wanted to put my two cents in on farming this crafting material having tried all the locations listed below. While they are mostly "ok" places to farm, I , like most people would rather have a better consistent yield / spawn & a less camped location than most of the places listed below. I found that the spawn rate is decent because these mobs are a quest objective which always seems to help spawn rates. But.. even if there are other people out doing the quest it seems to be no issue since these mobs spawn all the way south toward the coast and the Shimmer Moor and north most of the way to Elodor / Shinri country. If you take a skinner you can get double duty in this location (always a nice perk) and even tho it yields scraps these do add up as well. The meat is also still "decently" priced in AH so time spent farming the fur here has a few ways to make it at the very least "minimally" profitable. I chose tailoring, as many other clothies, for the fine art of delicate fabrics, not for butchering animals. And to the comments that say "we are making cloth from the fur of the animals for eons blah blah", the answer is we don't kill the sheep in the process, giving it to Zlagk The Butcher and turning it into pieces of meat just to get the fur. We are not leatherworkers. Plz Blizz reconsider. I tried farming this in various places but by far, the barn is superior for this. There are 2 dens that have about 8-10 frost wolves and the respawn time is pretty quick. You can get about 1000 per hour if you are fast enough. Here is a video showing the exact spot. Also its worth noting that they are skinnable as well! Can anyone confirm at all if they nerfed the Frostfire Ridge farming area for fur? Shivering Trench. Wanting to see how much fur and gold I could earn making loop just outside of Temple of Karabor. I send all my gold but 5g to alt. In 45 minutes I got the following results. 4 gold from junk items 150g. I'm sure some people have done better and others worse but these were my personal results. For lowbie farming like me. Best bet is the Eleks in shadowmoon. However saberon on most places do good as well. Found a great farm in Shadowmoon Valley. Coords 30,29 The wolves are called injured stalkers. Realm hop and reset the blacklist. Fast respawn. Farmed 800 per hour plus the trash items are very expensive to sell. Several hundred gold in trash. Guide to Sumptuous Fur farming. Guide to Sumptuous Fur farming here. 1. The northern one has too many mobs in caves, and as they die instantly, you're running around alot to loot just 1 body. 2. The southern one has too few mobs. They don't respawn fast enough. The Bloodmane pridelands farmingspot in Spires of Arak is well suited for instakills. It is so large that you are never out of mobs, even with people questing there at the same time. As a current level 110 and a Tailor, my favorite farming spot is under Bladespire Citadel's bridge. There's tons of mobs called "Wooly Clefthoof"'s that also respawn very fast. I just flightpath over to Bladespire Citadel and run down onto the icy river. I get around 100 fur in about 10 minutes or so. Today i was farming it on my DH since i needed it to make bags on tailor i found Nagrand as a good place and if you are skinner too its also good for it. I killed the clefthoofs and talbuks in the area shown on map, on inner side between those 2 flightmasters. Besides a good droprate for the fur that was 1-4 each time i also got Gorian Artifact Fragments if you need reputations with the goblins in Nagrand, droprate was also 1-4 on those and sometimes a rare one., skinning those they give up to 4 leather too. "Fell von in Draenor heimischen Pelztieren. Wird zu Stoff verarbeitet."